This webinar is now over, but if you missed it, please feel free to watch the recording below. Mental health disorders occur more often in children with neurodisabilites (ND) than in their peers, with only a small percentage receiving mental health care. To help alleviate this troubling situation, researchers partnered with parents to adapt an existing online parenting program to the needs of families of children across neurodisabilities. Combining educational modules with group coaching and -parent-to parent support, Parents Empowering Neurodiverse Kids is the latest in a suite of Strongest Families programs designed to provide parents with skills to help manage their children’s challenging behaviours and holds promise to improve quality of life for children with diagnoses across NDs and their families. This new program will be tested in an upcoming study open to families across Canada. 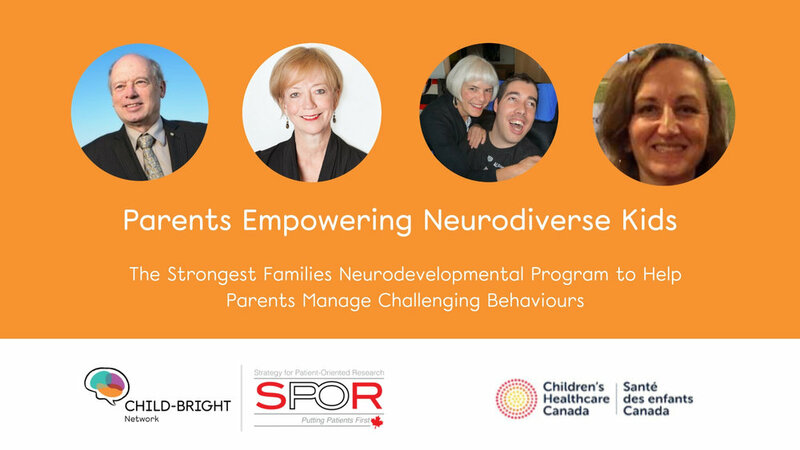 This webinar will introduce you to the Parents Empowering Neurodiverse Kids program, discuss families’ involvement in this research, and let you know how you can take part or refer others to the study. The Strongest Families Neurodevelopmental project is part of the CHILD-BRIGHT Network of researchers dedicated to developing innovative interventions to improve long-term outcomes for children with brain-based developmental disabilities and is funded in part by the Canadian Institutes of Health Research’s Strategy for Patient-Oriented Research (SPOR). Patrick McGrath is a clinical psychologist, scientist, senior health administrator and social entrepreneur. He is Professor of Psychiatry, Pediatrics and Community Health & Epidemiology at Dalhousie University and a Scientist at the IWK Health Centre. His major career focus has been to use research to improve care. His research resulted in the not-for-profit Strongest Families Institute that delivers mental health care to thousands of families across Canada and in Finland. His research focuses on two areas: the use of technology to deliver care and pain in child health. He has published extensively and won many awards and recognitions. Dr. Lach is an associate professor in the School of Social Work and an associate member of the Departments of Pediatrics, Neurology and Neurosurgery, Faculty of Medicine, McGill University. Her program of research focusses on the quality of life of children with neurodisabilities and their caregivers (i.e. caregiver health and parenting). Dr. Lach's current projects address social determinants of health of children with neurodisabiltiies. She is co-leading a team of researchers and trainees whose projects have been funded by Kids Brain Health Network (KBHN) and the Social Sciences and Humanities Research Council (SSHRC) to document determinants such as income, service use, educational outcomes, and uptake of income supports such as the Disability Tax Credit using population-based as well as administrative and clinical databases. She is also collaborating with Dr. David Nicholas to increase capacity in navigation systems that support families of children with neurodisabilities in Vancouver, Edmonton and Yellowknife. In addition, she is part of a recently funded Strategy for Patient-Oriented Research (SPOR) network called the CHILD-BRIGHT Network, and is co-leading (along with Dr. Patrick McGrath) development and implementation of a randomized controlled trial entitled the Strongest Families Neurodevelopmental Program. This project is evaluating a web-based program that combines group coaching and educational modules with parent-to-parent support for parents whose children have a neurodisability and mental health concerns. Dr. Lach is a peer-reviewer for numerous journals and organizations that provide research funding. Donna is the author of The Four Walls of My Freedom: Lessons I’ve Learned From a Life of Caregiving (The House of Anansi Press, 2014) and is the co-author of The Unexpected Journey of Caring: The Transformation of Loved One to Caregiver (Rowman and Littlefield, June 2019). She blogs regularly at her website, The Caregivers’ Living Room (www.donnathomson.com). Donna has a passionate interest in family engagement in health research. She is a board director of Kids Brain Health Network and is the co-designer of a new post-graduate, online course in the area of patient and family engagement in childhood disability research at McMaster University. She is a senior family advisor on the SPOR CHILD-BRIGHT Network and a co-researcher on the Strongest Families research project team. Karen is a Research Coordinator at the Centre for Research in Family Health at the IWK Health Centre. Karen has extensive knowledge of Strongest Families parenting programs and has worked closely with the Parent Advisory Committee, practitioners and the Strongest Families Institute in modifying the program to ensure its relevance to families of children with neurodevelopmental disabilities. She has expertise in managing large randomized controlled trials and looks forward to providing support to parents and other stakeholders interested in taking part in or referring families to this important study.